DESCRIPTION: 'QUITE SIMPLY...SUPERB! A stunning and thoughtfully extended 3 bed semi-detached home situated within walking distance of Cheadle village centre. In brief the accommodation comprises, porch, entrance hall, good sized lounge, superb fitted dining kitchen with bi-folds opening to the rear, three well-proportioned bedrooms, impressive bathroom and separate wc.In addition there is a useful loft (accessed via retractable ladder). Outside, accessed via wrought iron gates, a driveway and hard standing provides off road parking to the front. To the rear there is a delightful lawned garden with children's play area, timber summer house and block paved patio area. VIEWING A MUST! LOCATION: Warren Avenue forms part of a mature, popular residential area, situated within easy walking distance of Cheadle village centre and all its attendant facilities. For the commuter, the North West motorway network can be accessed approximately half a mile away. Excellent State and Independent schools serve the area. DIRECTIONS: From our Cheadle office proceed along Gatley Road in the direction of Gatley. Turn first left into Warren Avenue. The property can be found on the left hand side. PORCH Upvc double glazed porch with tiled floor. ENTRANCE HALL Accessed via Upvc double glazed door, stairs to first floor, radiator, tiled floor with under floor heating. LOUNGE 19' plus bay x 11' 10" (5.79m x 3.61m) Upvc double glazed window, feature cast iron fireplace with open grate and marble hearth, four wall light points, two radiators, laminate flooring, coving to ceiling, double doors opening to the dining kitchen. LANDING Upvc double glazed window, access to fully boarded loft with two Velux windows, and radiator via pull down retractable ladder. MASTER BEDROOM 12' into bay x 11' 7" (3.66m x 3.53m) Fitted wardrobes, Upvc double glazed bay window, picture rail, radiator. BEDROOM TWO 10' 8" x 8' 5" (3.25m x 2.57m) Upvc double glazed window, radiator, picture rail, fitted wardrobes with courtesy lighting. BEDROOM THREE 10' 3 " x 9' 5" (3.12m x 2.87m) Upvc double glazed window, radiator, picture rail. 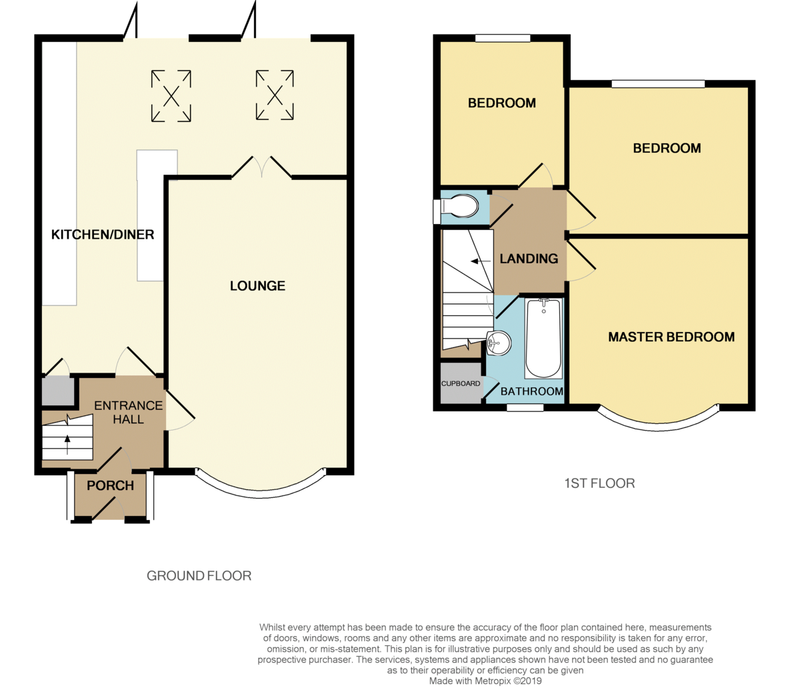 BATHROOM 6' 7" x 5' 9" (2.01m x 1.75m) Fully tiled bathroom with white suite comprising shaped bath with overbath shower and screen, hand wash basin, Upvc double glazed window, ladder style radiator, storage cupboard, tiled floor with under floor heating. SEPARATE WC. Fully tiled room with low level wc, tiled floor with under floor heating, Upvc double glazed window. OUTSIDE To the front of the property a block paved driveway provides off road parking via wrought iron gates. To the rear the is a good sized, mainly lawed garden with block paved patio, bark chipped play area, timber built summer house, and shrub/flower borders.